File tagging on the Mac is part of Mac OS X, but those who have been using the Labels feature to help manage their files in prior versions of Mac OS X will notice it’s actually quite similar. Basically you ‘tag’ a file, and then it becomes associated with that tag, allowing for easy file sorting, searching, and management. Tagging is easy to use, and what are likely the two simplest ways to tag files are during the file saving process, which we discussed with some other basic Mavericks tips here, and also with the hugely useful drag & drop trick, which we’ll cover next. Drag & drop tagging may be the single best way to use tags from the Finder, because not only can you tag a single file just by dropping it onto the tag you wish to assign, but it allows for rapid batch tagging of huge groups of files and folders with the same trick. You will obviously need the Finder sidebar to be visible for this trick to work, if it’s hidden for some reason you can reveal the entire sidebar again by hitting Command+Option+S, if the tags themselves are hidden you likely just need to hover over the “TAGS” text and click the “Show” option when it appears. Super simple, right? 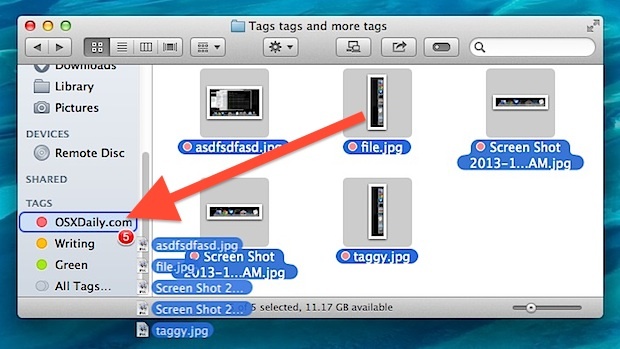 This drag and drop trick is the fastest way to quickly tag your files and folders directly from the Mac OS X Finder. Once a file is tagged it will have a little circular icon next to it indicating the related color. Files tagged with multiple different tags (yes, you can assign multiple tags to anything) will have several overlapping color circles next to the file name. You may want to create or rename a few tags to get the most use out of this. 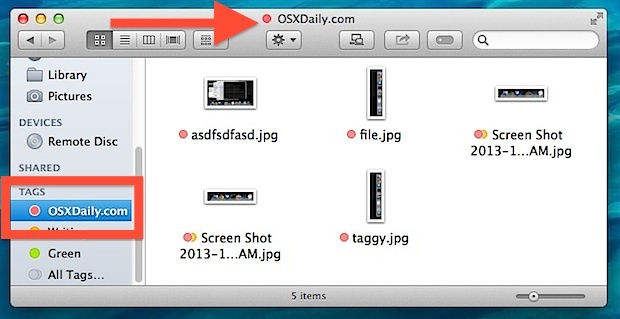 That can be done directly from the sidebar, or with Finder preferences. Accidentally gave something the wrong tag? Deleting or removing tags from a file is equally simple, you can just right-click a file, folder, or group of files, then choose the same tag to remove it. And yes, Tags used to be called “Labels”, just in case you were wondering why some of this sounds so familiar to longtime Mac users. Darn, I was looking for weeks to fix this but I just figured it out. In the Finder prefs, Tags tab, none of the tags were selected to show. So stupid! How about removing the tags?